It's on-the-job training for your nerves as Radio's Outstanding Theatre of Thrills takes a look at crimes and calamites in the workplace! Listen to the "Man in Black" as he introduces you to corrupt colleagues who are responsible for more than the bottom line. But don't worry. 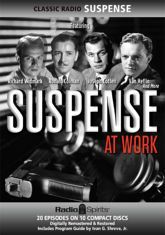 You're in the hands of professionals with Van Heflin, Ronald Colman, Joseph Cotten, Elliott Lewis, Joseph Kearns, William Conrad, and Richard Widmark. This ten CD collection includes twenty digitally restored and remastered episodes, and a Program Guide by Ivan G. Shreve, Jr..